CHRIS Spring is trying not to think about the perils of his chosen sport, but admits the responsibility of steering a team sled at up to 135kmh "can definitely weigh on you". The 29-year-old will represent Canada next month at the Winter Olympic Games, after leaving the Sunshine Coast in 2010 to pursue his career dreams. He told the Daily last month that only a medal would suffice at Sochi. But Spring knows how dangerous the sport can be. He was piloting the Canada Two four-man sled early last year when it smashed into a wall during the World Cup round of Altenburg, in Germany. Spring was hospitalised for eight days after a piece of wood became embedded in his back and cut him to the bone. 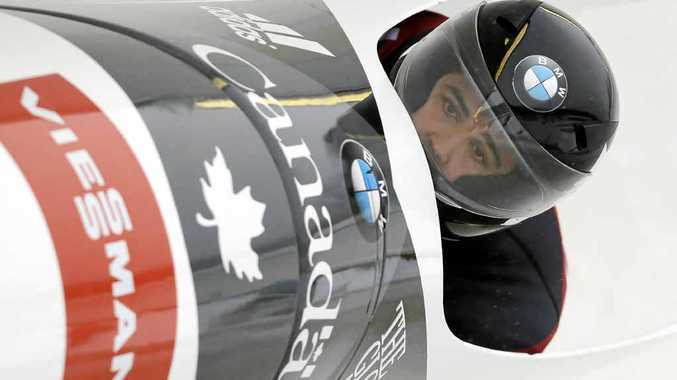 Having returned to the track three months later, he has since helped Canada's bobsled team become a global force. Still, the dangers of the sport are in the back of his mind and he admits to battling inner demons when things aren't going well. "The toughest part of my job would be dealing with the responsibility that comes with being a bobsled pilot," Smith said yesterday. "I essentially have the safety and wellbeing of my crew in my hands every time we jump in a sled, and for the most part I don't think about it. "BUT when I am not driving well or things are not going to plan, then that responsibility can definitely weigh on you and it can become a constant battle that I have with myself, one that can only be won with the confidence from my team, the confidence from myself and the support of family and friends." As pilot, Spring controls the sleds with his hands and fingers, using rings that are attached to a steering mechanism by ropes. Competitors wear a specially made high-tech plastic composite helmet that helps prevent head injuries. He and his team are already familiar with the Sliding Centre Sanki, which is nestled in Rzhanaya Plyana, 60km north-east of the Games' host city. The track was designed to be safe, following the death of Georgian luge rider Nodar Kumaritashvili during a training crash before competition at the 2010 Winter Olympic Games in Canada. "The track is awesome and unique with its own personality," Spring said. "It is a technically challenging track where mistakes will cost you a lot of time. "In a nutshell, the track is easy to make it down but very difficult to find the speed to be the fastest to the bottom." Spring competed for Australia at Vancouver, finishing well outside the medals.